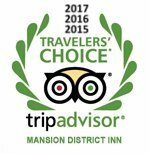 Mansion District Inn B&B, 905 W. Main Street, Smethport, Pennsylvania, has been selected by TripAdvisor as “one of the top 25 Bed and Breakfasts nationwide” for the fourth consecutive year – 2018, 2017, 2016, and 2015. Enjoy a three-course gourmet breakfast, and a lovely choice of distinct room and suite rentals, suitable for romantic getaways, outdoor enthusiasts or business travelers. Relax in the library, refresh yourself with evening beverages in the parlor, take a stroll through the Smethport Mansion District, or kayak or fish on Hamlin Lake. 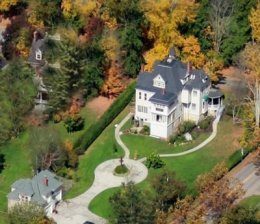 Nearby attractions include the Old Jail Museum, Kinzua Sky Walk, Zippo, the Allegheny National Forest (ANF), Scenic Route 6, the Eldred WW II Museum, and the extensive four-season trail system. The Mansion District Inn is the perfect venue for small events. Plan your next business meeting, bridal shower, baby shower, or wedding in the Golden Oak Dining Room. Call for pricing.